Much like carbon monoxide, you cannot see, smell, or taste radon. It's a cancer-causing, radioactive gas that causes thousands of deaths each year. Radon occurs from the natural breakdown of uranium in the earth and is released into the air you breathe. Radon comes from the soil and builds up in your home. All homes are under vacuum, from dryer vents, furnaces, fire places, exhaust fans, range hood vents etc. All of these pull the radon in to your home. For the average person, radon is the largest single contributor of their total exposure to ALL forms of radiation. Radon levels can vary greatly from one home to another and also are higher in the winter and lower in the summer. Newer construction homes can have higher radon levels because they are sealed better with house wrap, better windows, and thicker insulation. This means they are more likely to have a higher negative pressure which causes higher radon levels. Curious of the predicted radon levels in your area? Check out the chart below for the EPA Map of Radon Zones in Pennsylvania. The average radon level of outdoor air in our area is 1.7 pCi/L, but the average home in PA has an average level of 7.7pCi/L! Radon gas problems can be fixed. If radon is present in a home it can be diverted with a radon mitigation system. These systems are permanently-installed soil depressurization systems. 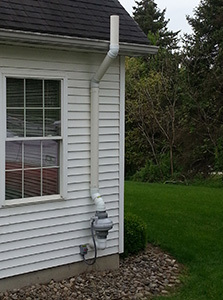 2E Contracting, LLC installs the highest quality radon mitigation systems that protect your home from this cancer-causing gas. Who should test their home? The PA DEP, Radon Division recommends that ALL homeowners test for radon. Click here for more info on testing your house for radon.